Have a DDDAC 1543 mkII, assembled long ago, about 10 years. Worked fine back then. Fast forward to 2019, I'm having trouble with USB (PCM2707) getting recognized: USB enumeration errors. PCB looks fine, apart from some rust on not used pads. Gave it a thorough clean, and reflowed all solder joints on non SM parts. It gets recognized one time out of fifty. Usually after tinkering measuring live voltages on it. I followed Texas Instruments Troubleshooting USB enumeration errors but found nothing. Uses Guido Tent XO, measured freq with a digital multimeter, stable 12MHz. Tried several USB cables, and different computers, same symptoms. Tried battery power, and the hefty transformer linear unregulated PSU I use with it; same issues. Any hints or pointers welcome, don't have a clue what to check for next. Last edited by pukka; 29th January 2019 at 11:59 AM. Last edited by miro1360; 30th January 2019 at 03:49 AM. Thanks miro1360! Will measure that. So the usual suspect is the PCM2707? It came proffesionally soldered, it does even have mask on top of its legs. Already have a Hecate XMOS208 TCXO coming... have a Tent XO on the DDDAC board, these have provided me stellar results on reclocking scenarios so wanted to try salvaging it. Don't have a clue about relative precisions of Tent XO vs the Hecate, guess should be on par? Last edited by pukka; 30th January 2019 at 05:21 PM. 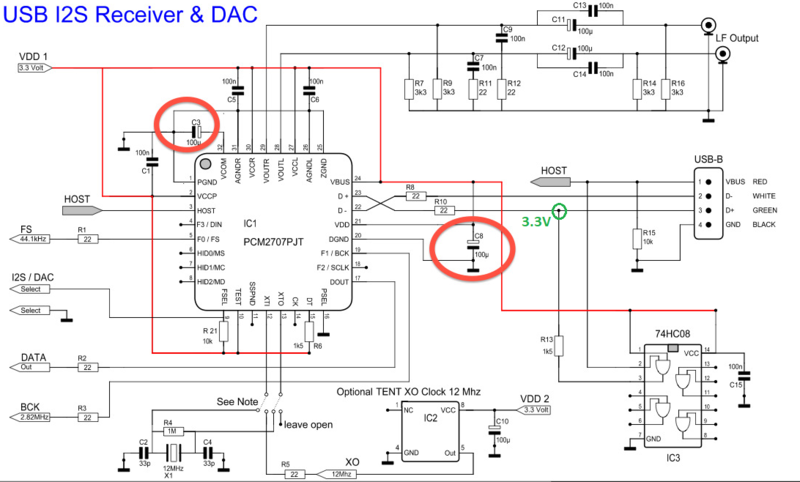 TDA1543 is R-2R DAC and is not so sensitive to the jitter. You do not need to deal with tens of jitter.